Members of OASI attending the OASI@Newbourne meeting on the evening of 13 August heard several prolonged meteor pings from the Graves radar. (A French space surveillance transmitter located near Dijon, operating on a frequency of 143.050 MHz.) 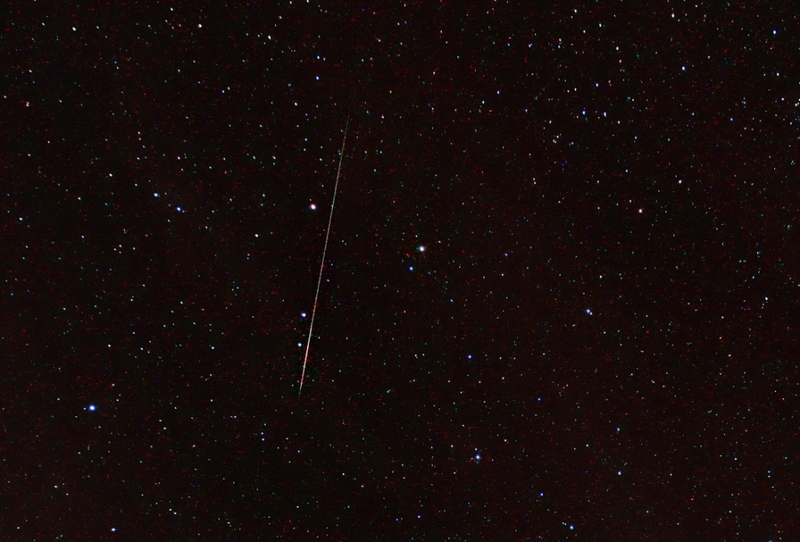 At 21:30 UT, Andy Gibbs saw three Perseids in five minutes. Thereafter, the sky became progressively cloudy, and there were no further sightings. The peak of the 2018 Perseids was forecast to occur at approximately 01:00 UT on 13 August. Unfortunately, the weather forecast was not encouraging and, around the time of maximum, only the evening of 10 August offered a reasonable prospect of successful observations. 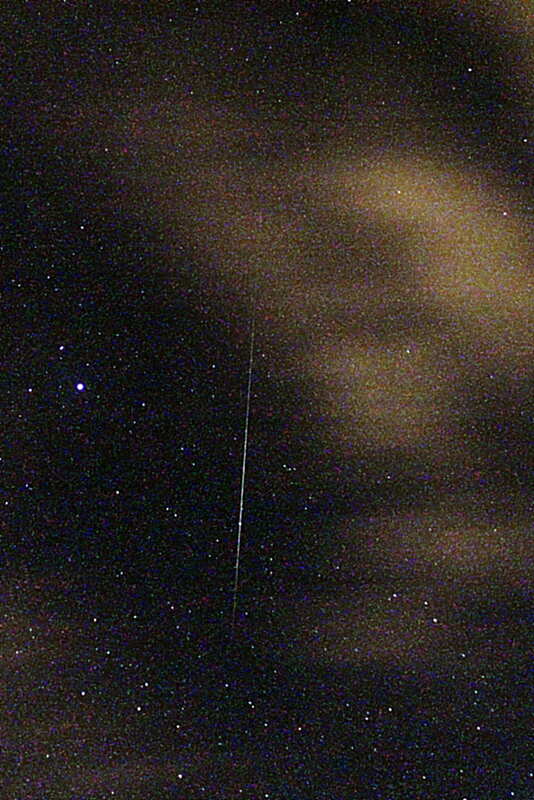 I took a sequence of images on 10 August, ‏‎21:39:15 to 23:56:26 UT, hoping to catch images of a few early Perseids. 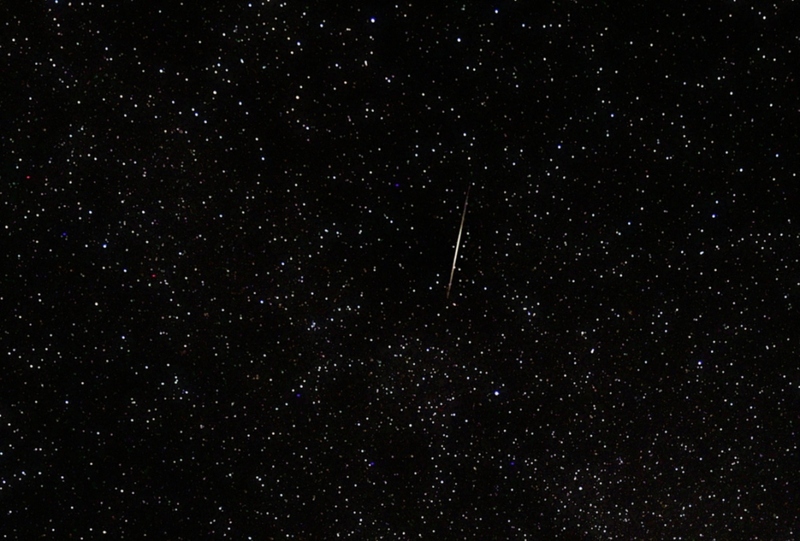 Below is a montage of the meteor trails that I recorded (aligned and superimposed by hand). Alas, I captured at most one Perseid (no. 2). 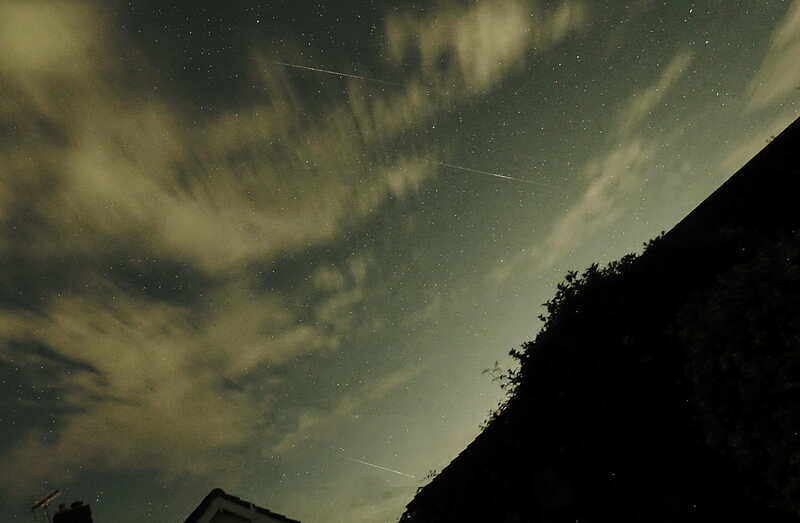 However, one pair of meteor trails (no. 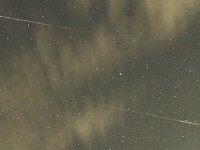 6 in the image), captured in consecutive frames, is interesting, perhaps representing a meteor with a gap in its trail, or maybe just a coincidence of two independent tracks with the same alignment. 22:43. Note the greenish colour of the trail. 23:15. Dual trail; the LH portion has a yellowish hue. Mike Norris, Ipswich. On 12 August, the forecast was for cloud by midnight so I did an early watch in my front garden - not the darkest venue! 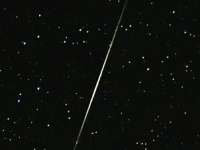 I saw five bright Perseids at the following times (UT): 21:51, 22:04, 22:10, 22:20 and 22:41. High cloud then rolled in and I retired. Mike & Andrea Whybray, Nacton. On the evening of 12 August, we saw seven Perseids between 21:30 and 22:05 UT from our back garden at Nacton, looking roughly NW. The sky was clear but contrast was not very good due to thin, high cloud plus the setting Moon. Andy Gibbs, en route from Ipswich to Rugby. On the night of 11-12 August, I was driving a train from Ipswich to Rugby. At 21:00 UT, shortly after leaving Ipswich, the skies were mostly clear and I observed a conjunction of the Moon, Saturn, Mars and Antares. 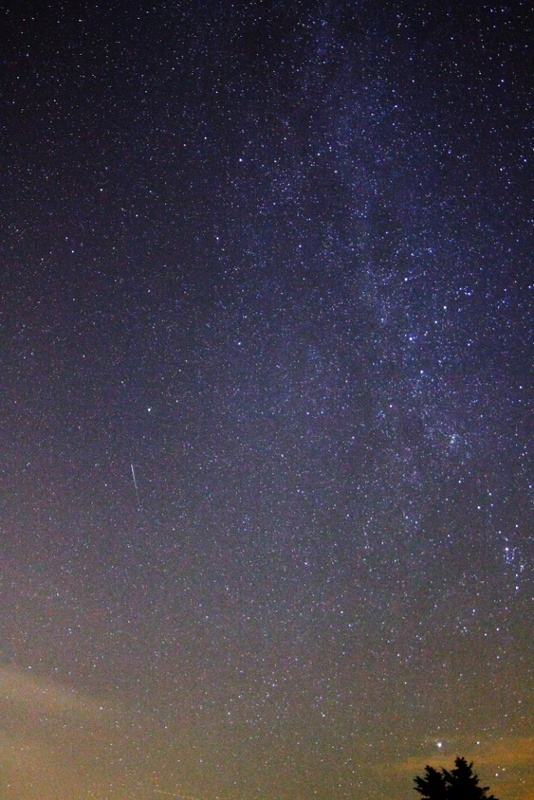 I first observed a Perseid at 23:15 UT, through the light pollution of London, when I was just north of Wembley. I then moved under clouds. North of Milton Keynes, the sky cleared and was darker than previously and I observed four more Perseids, including a really bright one at 00:30 UT when I was near Weedon. I arrived at Rugby at 00:45. By the time I commenced my return journey at 01.40 UT, it had clouded over. Work commitments prevented me from maintaining any kind of watch for meteors on the following evening. Paul Whiting, FRAS, Devon. 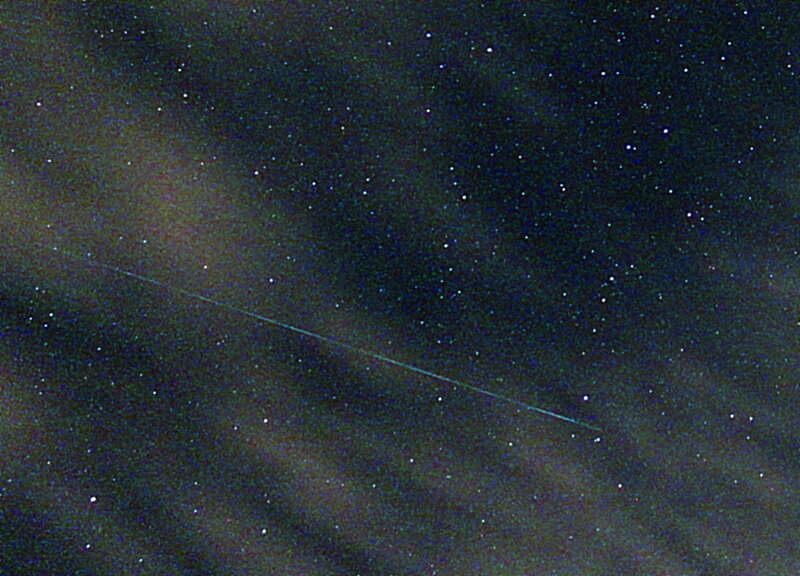 11 August: I saw the ISS around 21:20 UT but very few Perseids because of light pollution. I then moved to the back garden looking NW and saw about 10 Perseids over an hour or so, all quite short and fast-moving. 12 August: I only watched for 20 minutes before cloud rolled in, during which time I saw just one very long (120°) medium-fast meteor around 21:20 UT. 13 August: I spent the day at the Norman Lockyer Observatory for the South West Astronomy Fair. I observed many huge meteors over France as radio "pings" from the GRAVES radar equipment near Broye-lès-Pes. Mike Nicholls, Vietnam. There was no chance of observations in Vietnam on 13 August due to cloudy skies and the occasional tropical storm - the best that I could manage was occasional glimpses of the Moon! The image at 21:13 UT captured M31, the Andromeda Nebula (visible in the full frame but not the thumbnail). 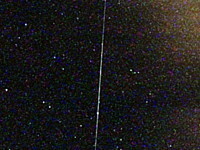 The lower portion of the image at 22:25 UT shows a satellite trail (not visible in the thumbnail). 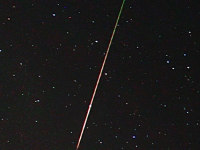 The meteor trail and satellite trail look clearly different. 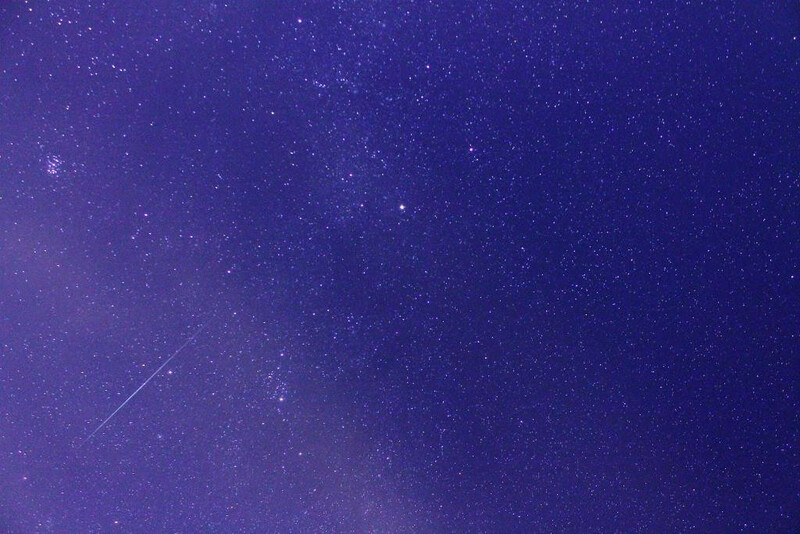 Mike Whybray Saw eight meteors in 20 minutes starting at 22:30 UT from the back garden of a pub near Stratford upon Avon. 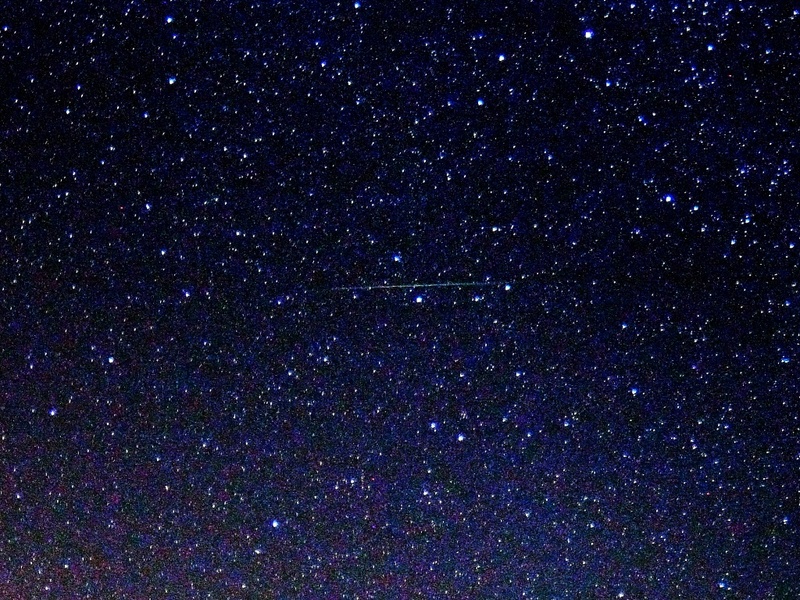 The show included one bright meteor leaving a trail. The sky was mostly clear but the view to the north was restricted. 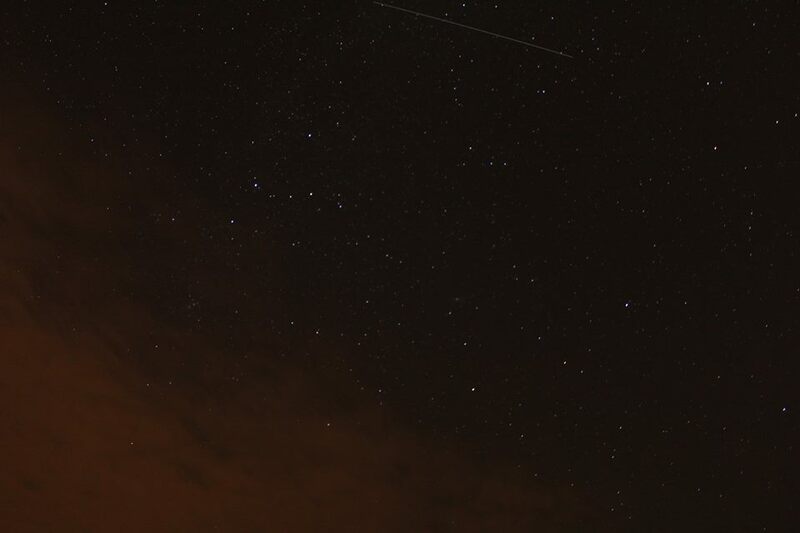 Mike O'Mahony Saw about eight meteors in a 30 minute slot around 22:30 UT at Felixstowe. Some were very bright, low, and exhibited long trails. One was a double, looked like two slightly separated; I have never seen anything like it before. 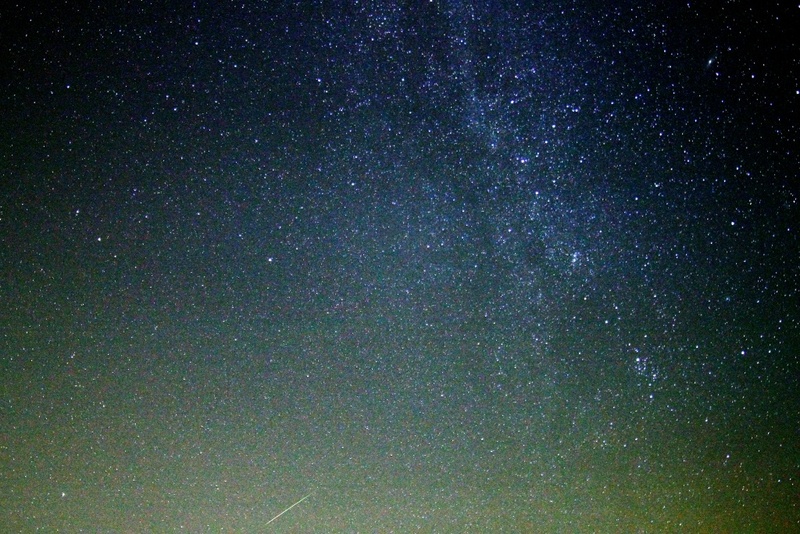 Paul Whiting, FRAS While en route from Shetland to Edinburgh, I saw approximately 12 Perseids. 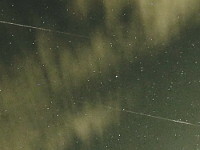 Andy Gibbs Many Perseids at Newbourne, some with good green trails. 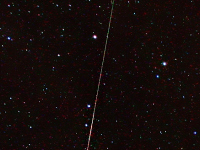 Figure 2 below shows a Perseid trail to the north of Cassiopeia. Canon EOS 1200D camera, 18-55 mm lens, ISO 3200, 30 seconds exposure. Image processed with Canon Digital Photo Professional software. 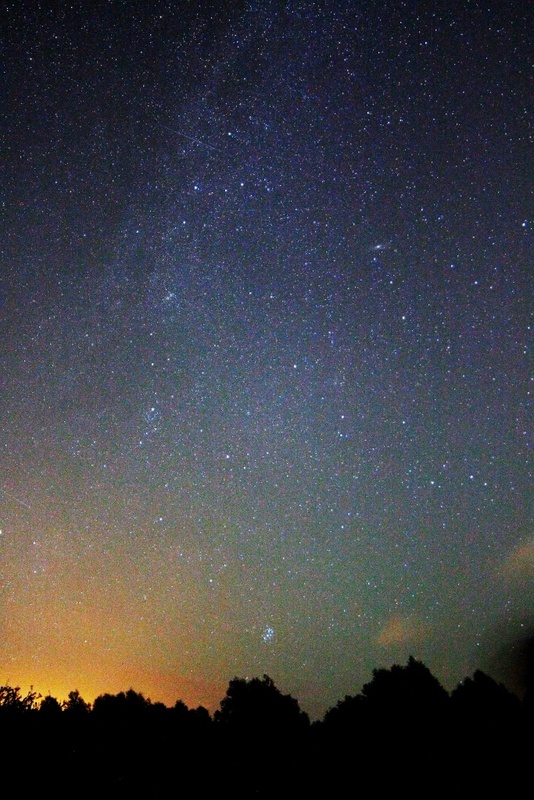 David Murton It was a great night at Newbourne with crystal clear skies showing the Milky Way. The Cygnus rift was visible to the naked eye. M13 was really clear in binoculars with some hint visible of the structure of the outer arms. 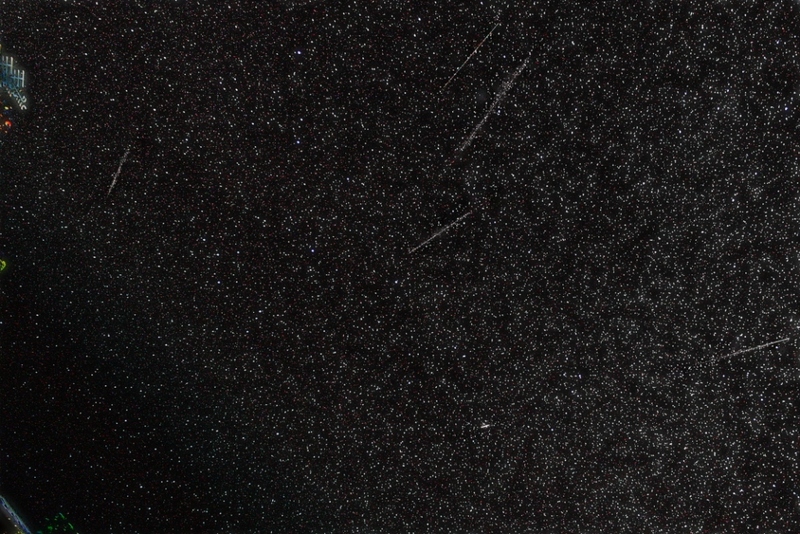 I took 270 frames and caught eight meteors. 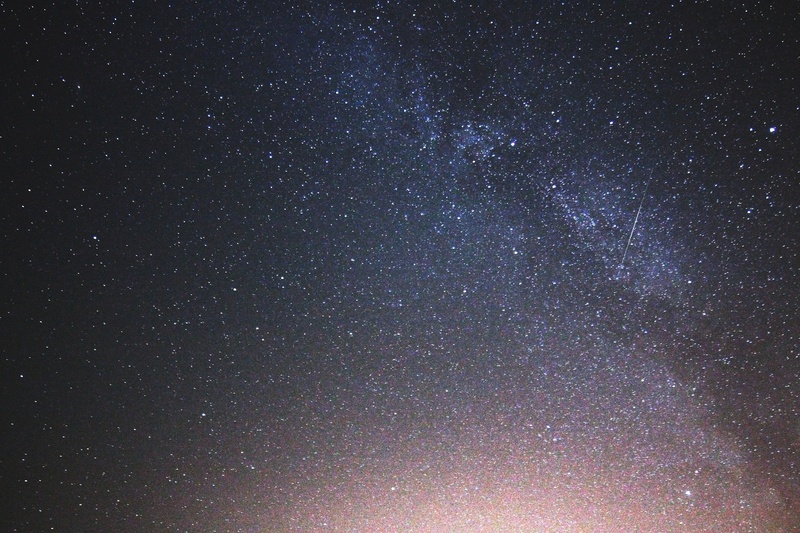 I used a 14 mm lens so the trails appear small, but the wide field of view helped to catch more! Figures 3-9 are 30 second exposures at ISO 3600, F2.8, Canon 1100D camera with Samyang 14 mm lens. Processed using the Canon DPP software supplied with the camera. giving a ratio of 20 to 1 radio to visual observations. I observed the visual meteors from Felixstowe, near the light-polluting docks. The preponderance of radio observations is plausible, as we only observe visually the larger meteors, those leaving an ionisation trail bright enough to be seen. 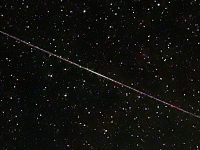 Radio propagation effects can take place with even the smallest of meteors. In eastern France, on a decommissioned airfield near Broye-lès-Pes, there is a radar station called GRAVES (Grand Réseau Adapté à la Veille Spatiale), a radar-based space surveillance system. (It has, allegedly, upset the Americans by detecting one of their spy satellites.) GRAVES is a bistatic radar system using Doppler and directional information to derive the orbits of satellites. Its operating frequency is 143.050 MHz. To listen for radio "pings" all that is needed is a radio scanner with a Yagi aerial. (It is easy to fabricate a suitable Yagi aerial out of wood and copper pipe. The standard "rubber duck" antenna on the scanner is probably not sensitive enough). Point the aerial towards eastern France and tune the scanner to 143.050 MHz CW (Carrier Wave mode - normally used for listening to Morse code). A meteor incoming over France vapourises and ionises the atmosphere, reflecting the radar signal. If the reflected signal is powerful enough to reach the scanner, it sounds like a "whistle", either at constant frequency or a rising/falling tone. The whistle is generated as a beat frequency between the fixed-frequency oscillator of the scanner and the Doppler-shifted reflected signal, depending on the speed and direction of the meteor. The amplitude and duration of the whistle can give information on the size of the meteor and the length of its trail. Observed 17:30 - 24:30 UT. 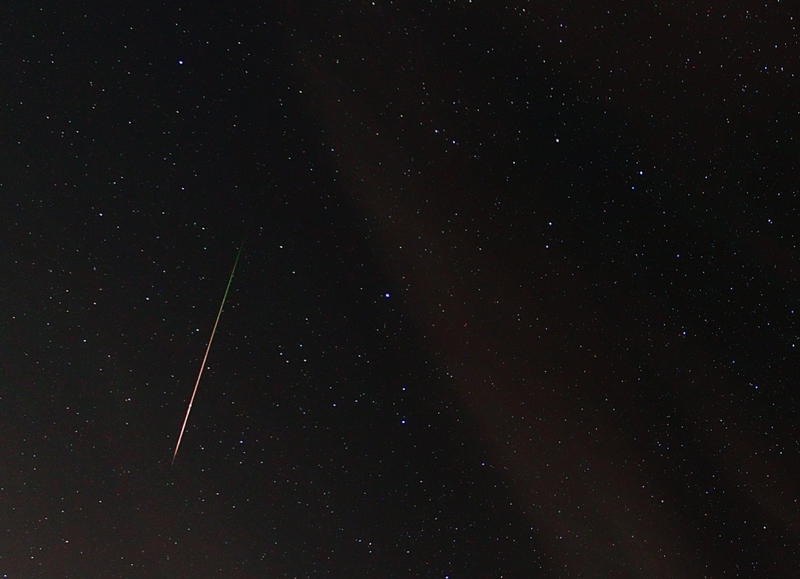 There were many Geminids all evening. 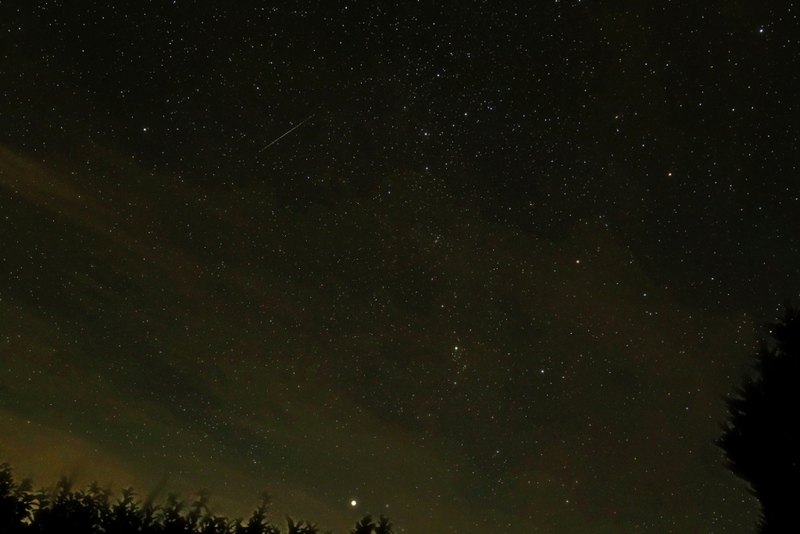 I captured the image on the right with a Canon 1100D camera and wide-angle lens. I observed on the night of 12-13 August. I saw many meteors by eye but only managed to record three with a digital camera as the all-sky lens I was using doesn’t have great sensitivity and can only capture the brightest ones. (The focus wasn’t very good either and, of course, several bright ones appeared between exposures!) A really bright one, visible on the extreme right edge of figure 1, went off behind me and lit up the wall of the observatory. The glow in the top right hand corner of the image is from Ipswich. 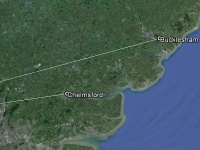 Nick James in Chelmsford observed the same meteor and, by comparing the altitude and azimuth from our two sites, was able to work out the range and height of the meteor. It started to glow at an altitude of 110 km and a distance from my site of 200 km (see figure 2). Our collaboration wasn’t planned but illustrates what can be achieved with a suitable baseline: this might be something we could do with other astronomical societies in East Anglia? Neither Nick nor I observed the end point of the meteor; had we done so, it would have been possible to work out an orbit for the object. 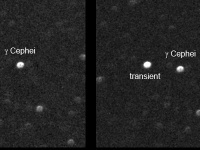 When I was scanning through the all-sky images I noticed an optical transient ("flash") near γ Cephei, appearing on only one 30 second exposure. I’ve enlarged the relevant area in figure 3 to show it with and without the transient. It looks stellar rather than like a satellite flare. Please contact me via the OASI website if you have images of this area of the sky on the night in question: info@oasi.org.uk. Fig. 2. Meteor tracks over East Anglia. Fig. 3. 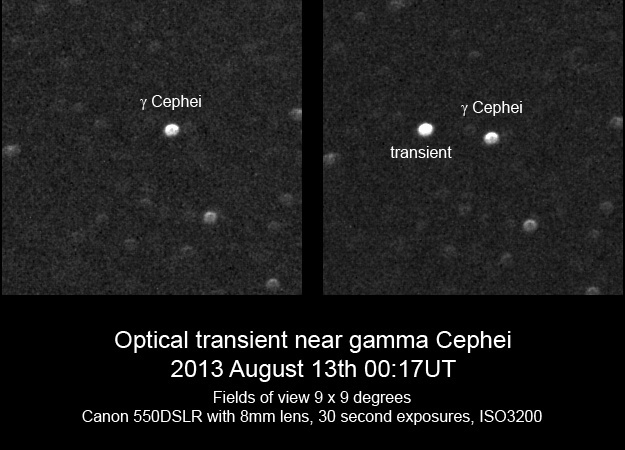 Transient near γ Cephei. 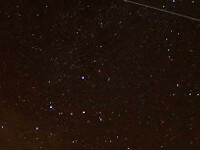 Other members of OASI who independently observed the Perseids in 2013 included: James Appleton, Matthew Leeks, Gerry Pilling, Martin Richmond-Hardy, Paul Whiting, Mike Whybray, Jennie Wood. Having enjoyed a sunny day, all looked good for viewing the promised shower of meteors but, with increasing cloud cover during the late afternoon and early evening, it started to look like the 2012 weather jinx had returned! However, just as darkness fell, the clouds started to break towards the coast and stars began to appear, so I threw the reclining garden chair into the back of the car and set off down to Felixstowe to see who else had come out to brave the brisk easterly wind! Arriving about 10.00pm I found a hardy band well wrapped up and sheltering behind the refreshment hut with Paul Whiting trying to get his new meteor detection radio software (early warning system!) to work. I think he must have borrowed the aerial from NORAD but I hope they have more success detecting incoming missiles! Apparently all the elements, aerial, laptop, radio, software worked OK individually, just not together. After missing some visual sightings while staring at the screen, Paul decided to try again another day and just rely on his eyes for the rest of the evening! As midnight approached, expectation grew for the promised high rate of meteors to become visible. Well, between the nine of us we saw a grand total of six before we called it a day at 12.15am! This may have been partly down to the restricted view of the sky due to us all being huddled behind the hut: Mathew Leeks went to Shingle Street and saw at least 15 during the same period. So, a reasonably successful evening, at least we saw something even if it was more of a drip than a shower and it was certainly warmer than it will be for the Geminids in December! As a footnote, I stepped out into the back garden the following night, looked up and instantly saw a very bright meteor flash across the sky and a satellite pass overhead! Pete & Nicky Richards We weren't sure of the start time of the OASI observing event, so went to High Road East just after 9.30pm on Saturday 14 August having been at the Felixstowe Carnival in the afternoon and early evening. There was no-one else there when we arrived so after a while we went home and observed from there instead. Some cloud rolled in after we'd been watching for an hour and twenty minutes. 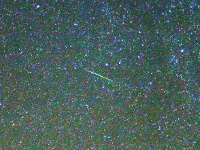 We saw only two meteors, both definitely Perseids; they arrived within about a minute of each other at around 22:05 UT. Gerry Pilling I watched on Thursday 12 August. During the period 00:30-01:30 UT I saw four meteors which were clearly Perseids: three very bright with trails and one dim. There was nothing like the 80/hr advertised! It became too cloudy at the end of my watch to continue observations. On Saturday 14 August, at the time I intended to observe, there was complete cloud cover and observations were not, in fact, possible at this time. Paddy O'Sullivan I observed from Kesgrave for approximately 20 minutes shortly after midnight on Thursday-Friday 12-13 August. 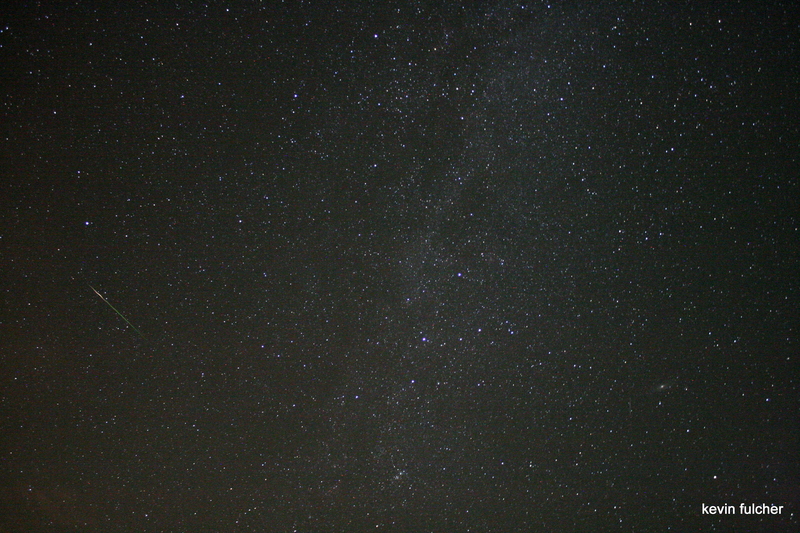 The sky was fairly clear but there was much light pollution. 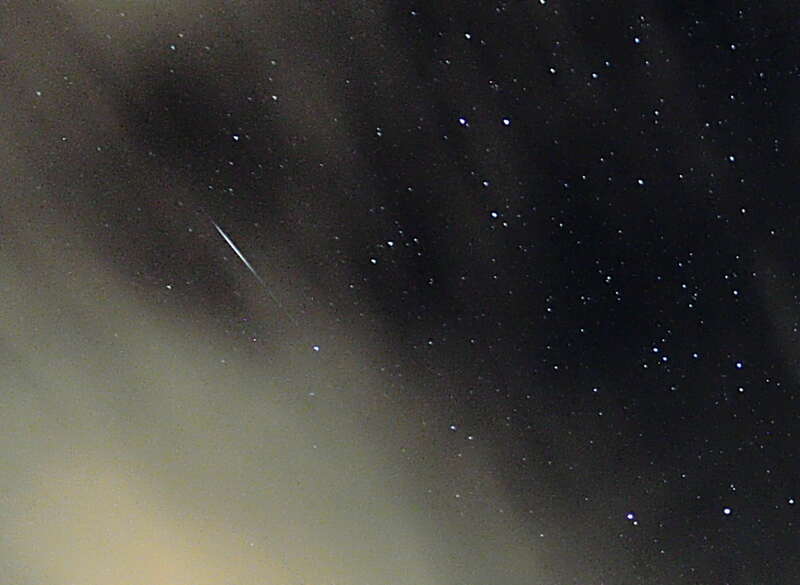 I saw one bright Perseid at 23:30 UT. It was not quite a shower! Raj Patel I may take a lead on observations! From 22:25-23:15 UT I saw eight Perseids. The first persisted in the east for almost half a second, and this encouraged me to wait around for further bright meteors. The next was almost 20 minutes later. All meteors after the first were much smaller and to the north. There was nothing like the predicted rate of 80/hr! Mike and Andrea Whybray We indulged in two observing sessions of the Perseids. 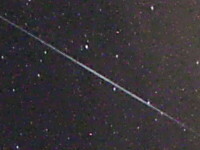 The first, from about 22:20-22:50 UT on Thursday 12 August, was in our back garden. Between us, we saw nine meteors of various sizes - none were spectacular, though one had a short track with a wide "fizzy" trail. The sky was pretty clear with the odd wisp of cloud. Mike Nicholls I observed for an hour on Thursday 12 August. I saw just one dim Perseid and a bright sporadic meteor. However, there was approximately 50% cloud cover during most of the period. Ben Powis On Thursday 12 August I went outside at approximately 00:30 UT and saw about 15 Perseids in 45 minutes. On Saturday 14 August, I went to High Road East, Felixstowe to watch for meteors, but no-one else was there, so I went on to the Clifflands car park: there, I saw only one Perseid in a period of about an hour. During an informal watch, several Perseids were spotted (including one real gem) but there were more sporadic meteors than Perseids. 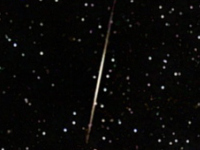 OASI held a very successful meteor watch for the 2007 Perseids. The BAA Handbook for 2007 predicted that the peak of the shower would occur at 02:00 UT (3.00am) on Monday 13 August, with a zenithal hourly rate (ZHR) of 80. However, observations on a Saturday evening rather than a Monday morning proved more attractive to members of OASI with responsibilities in terms of family and employment, even if the expected flux of meteors was considerably lower than its predicted peak value! The observers used the location on High Road East, Felixstowe (behind the beach huts) which has been employed in recent meteor watches. The first observers arrived at around 19:00 UT, with more arriving until 20:30 UT. They made themselves comfortable in preparation for the watch as best they could in a variety of reclining chairs. The sunny weather during the day resulted in an onshore breeze which provided a significant wind-chill. As a result, despite the fact that it was peak summer, observers were to be found huddling under blankets, swaddled in heavy-duty anoraks, and generally employing serious measures to keep warm! The meteor watch finished at 23:05 UT. Both Nicky Gillard and James Appleton recorded event times and notes on observations of meteors during the evening. The following list of meteor observations is a compilation/ reconciliation of Nicky's and James' records, based primarily on the former. Times are UT. S=sporadic and P=Perseid. The observer first spotting each meteor is recorded, where known. 20:24:?? P, east-ish to west-ish. First meteor seen! 20:53:?? P, estimated mag 3. 21:00:?? S, heading for Perseus, spotted by Pete Richards. 21:07:?? P, overhead, east to west. 21:15:05 P, overhead, east to west. 21:22:20 P, bright with train lasting approx. 1 sec. 21:23:25 P, spotted by Martin Cook. 21:25:17 P, bright with persistent train (1 - 2 sec.) & coma. 21:25:55 P, spotted by Martin Cook. 21:32:20 Uncertain P or S.
21:33:05 S, south to north. 21:39:40 P, spotted by Martin Cook & Pete Richards. 21:41:41 P, quite slow, just south of Vega. 21:46:55 P, just below Lyra. Train persisted for about 1 sec. 21:48:25 S, spotted by Martin Cook. 22:51:?? S, spotted by Roy Gooding. 22:01:05 P, bright, spotted to the north by James Appleton. 22:04:40 S, spotted by Paul Whiting. 22:08:?? P, faint and very fast. 22:24:00 P, passed from Delphinus into Aquila. 22:38:10 S, moved towards Perseus, left train. 22:44:00 P? Passed by Deneb. 22:58:25 P. Last meteor seen. Meteor rates between the first and last meteors observed were 6 sporadic per hour plus 15 Perseids per hour. At 21:44 the observers witnessed a passage of the International Space Station plus docked space shuttle (STS118) begin above the western horizon, pass overhead and proceed towards the eastern horizon. The object became noticeably brighter than Jupiter (mag -2.3) as it rose to high altitude and then faded as it headed for the eastern horizon. It became too dark to see, flickered visibly briefly and then became finally invisible at an altitude of approximately 30°. Late in the evening sky conditions and the relative absence of light pollution made for enjoyable naked-eye stargazing. 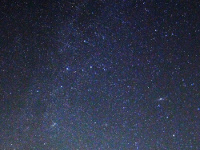 Both M31 and the Double Cluster in Perseus were easily visible to the naked eye using averted vision. The location offering an unobstructed SE horizon, the summer constellations of Sagittarius, Capricornus and Aquarius, often difficult to locate from built-up urban locations, were well seen. 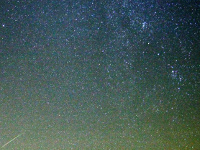 The Milky Way was prominent, and the rift in Cygnus was quite obvious. OASI members present were as follows (in alphabetic order): James Appleton, Martin Cook, Nicky Gillard, Roy Gooding, Pete Richards, Eric Sims, John Spicer plus guest, Paul Whiting, and Michael Whitman-Rivers plus guest. 22:04 P (approx mag -2), left a trail. Paul Whiting, Monday 13 August, observed from 00:30 to 00:32 UT (cloud rolled in curtailing observations). 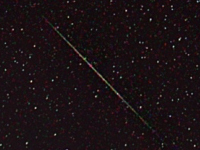 Observed one "miserable squib" of a sporadic meteor. 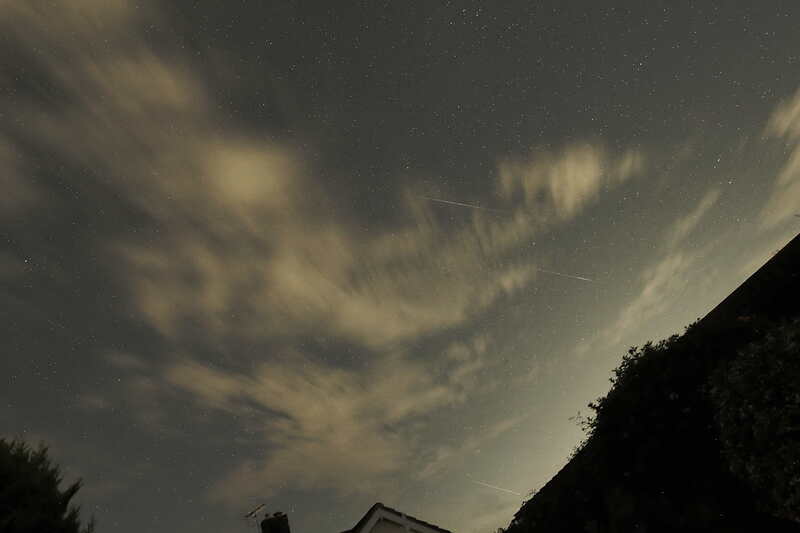 Mike and Andrea Whybray observed from their back garden in Nacton from 22:00 to 22:30 UT on 12 August. Their observing report: We observed lying in deckchairs facing north-west (our most open prospect). There were some clouds before 22:00 UT but by then it had cleared completely. Between us in that half hour we observed 12 meteors ranging from a few short faint ones up to a couple of good bright long ones covering about 70° of sky. The more memorable ones went from right to left across our field of view, but some of the smaller ones appeared to be in random directions. By 22:30 UT cloud started encroaching and we decided to retire. 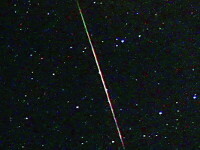 It was good to see a few bright ones but overall it seemed a long time waiting between meteors! 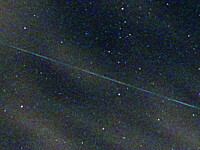 The Geminids maximum for 2006 was predicted for 05:00 UT on 14 December. 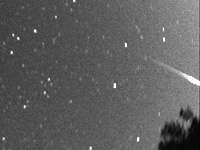 OASI organised a meteor watch on the preceding Saturday, 09 December. Observations proceeded as follows (times in UT). 20:10 Arrived and set up. The sky was moonless and very clear. 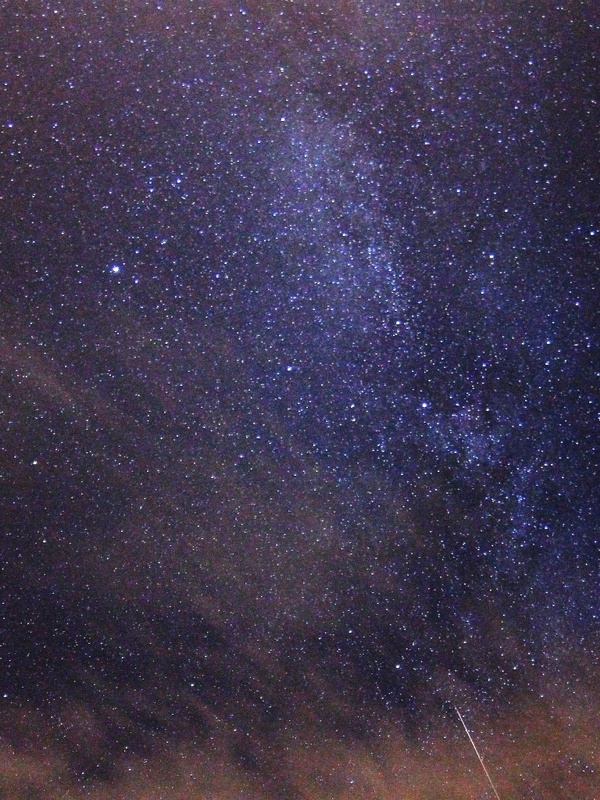 The Milky Way was easily visible. 20:30 The Moon appeared on the SE horizon, shining through a layer of haze. It presented a lovely deep orange colour. The observers could almost discern the Moon's altitude visibly increase as it rose above the horizon. 20:51 Martin Cook observed a Geminid heading from Gemini to the Pleiades. Duration <1 second. Mag 4? 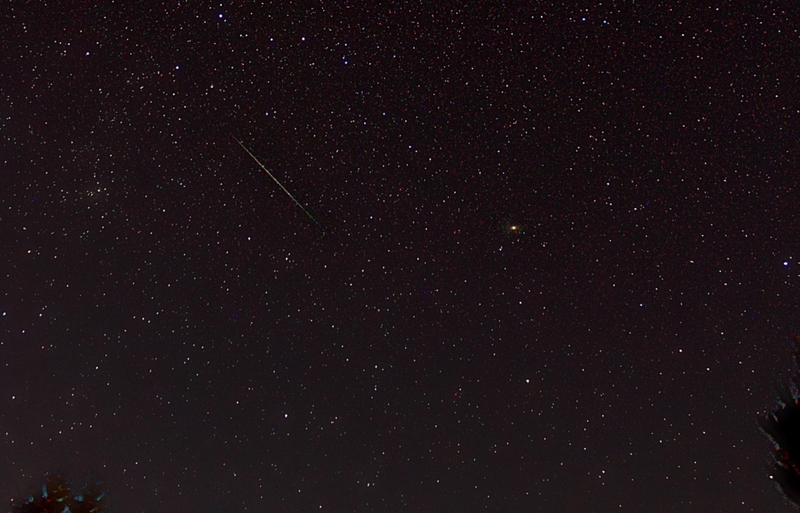 21:03 Martin Cook observed a sporadic meteor heading from Ursa Major to Gemini. Very brief duration. 21:42 Geminid heading from middle of Gemini due South. Duration ~0.5 seconds. Mag 2? At the start of observations the faintest star visible in the Hyades was mag 6. Shortly before the end of observations, after the Moon rose, the faintest star visible in the Hyades was mag 5. During the session the those present observed with a variety of binoculars (8x40, 10x50): M31, M34, M35, M36, M37, M38, M42, M45 (Pleiades), Hyades and Sword Handle clusters. M33 doubtful. Observers were: James Appleton, Martin Cook, Nicky Gillard, Roy Gooding, Gerry Pilling, Pete Richards, C & G Shepherd, Eric Sims, John & Carol Spicer and Paul Whiting. Pete Richards observed from Congresbury (North Somerset) 22:45-23:15 UT on 12 August. Skies were clear until 23:10 when clouds rolled in. He counted no (zero) meteors. Mike Harlow observed from Newbourne, near Ipswich, 21:15-21:35 UT on 13 August. He saw one Perseid. 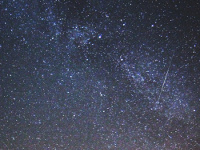 The primary peak of meteor activity for 1997 was predicted for 06:00 UT on 12 August, with a possibility that it could be up to four hours earlier. 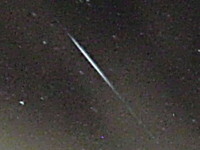 In any case, observers were expecting a good display of meteors in the evening of 11 August with an increase in activity after midnight, around the time the Moon set. The night of 12-13 August was also expected to be very good. 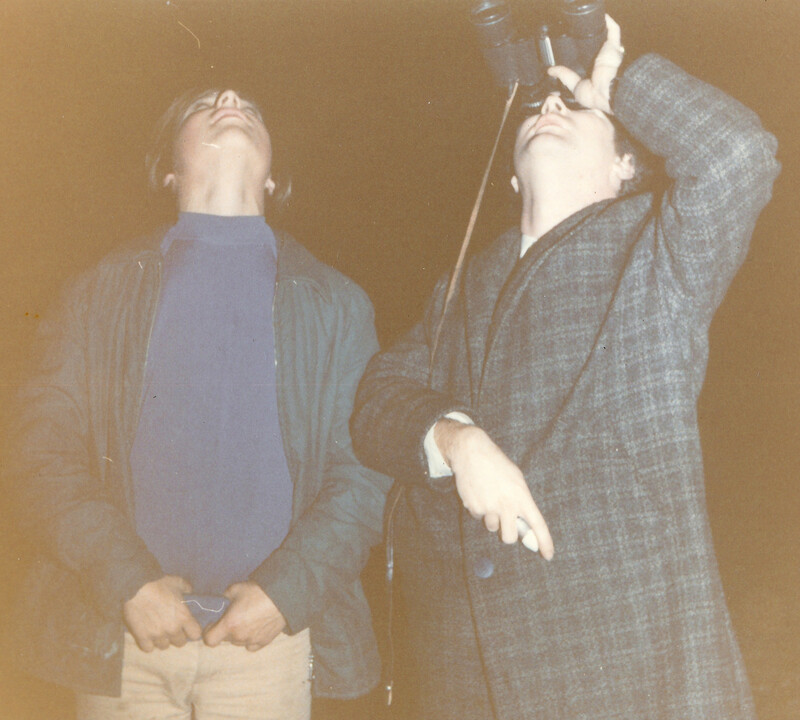 Mike Harlow planned to correlate observations of the Perseids by members of OASI in Suffolk with those made in Kent by Crayford Manor House Astronomical Society. 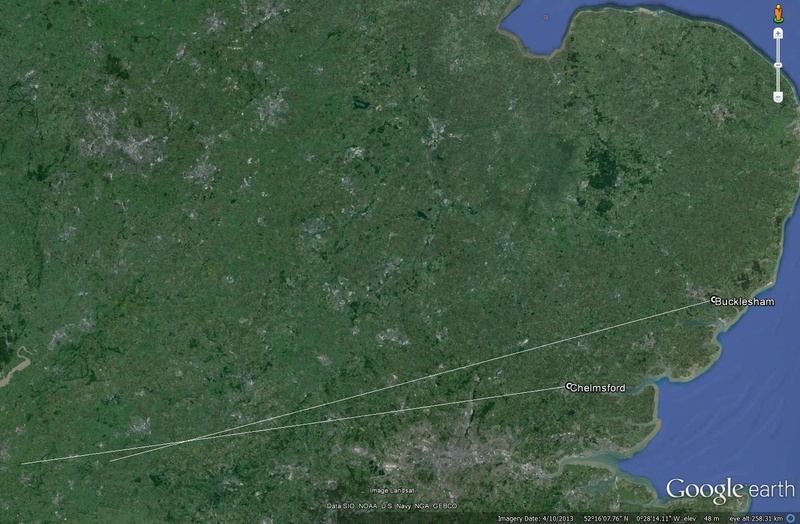 (CMHAS proposed a joint meteor watch when they visited Orwell Park Observatory in July). 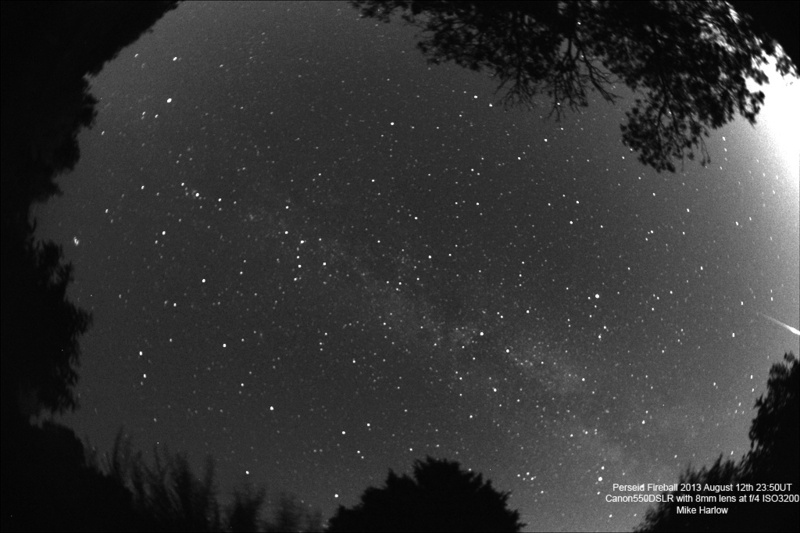 It was reasonably clear in Nacton around 00:00 UT on 13 August, although there was some haze and high cloud. However, over a space of 30 minutes, Pete counted only six meteors, none of which were bright. Observers in the US saw a very good display in the early hours of 12 August, so it seems that the Perseids peaked sharply when it was daylight in the UK and had declined dramatically by the time it was dark again here. The observers met at The Ship, Levington and then moved on to Levington Creek, which has been a site used for meteor watches for many years. Unfortunately, over the years conditions at Levington Creek have deteriorated due to the increase in light pollution from Felixstowe Docks, and this will probably be the last meteor count at the site unless no alternative can be found. 23:16 mag -2, finished near Vega, slight trail. 23:40 mag 1, seen through cloud. 23:50 mag 1, in Cygnus. 23:53 mag 2, sporadic seen to the South. 23:59 mag ?, below Cassiopeia. 00:08 mag -2, shower, trail. 00:24 mag -1, shower, through Hercules and Draco. Observers were: David Barnard, Mike Barriskill, Martin & Judith Cook, Roy Gooding, Pete Richards, Eric Sims, Alan Smith, Elaine Ward. 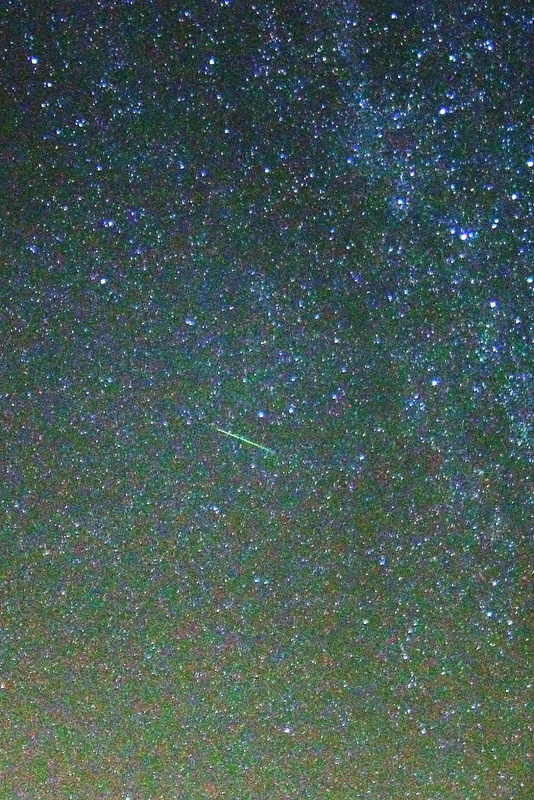 At 20:15 UT Alan Smith and I set off in search of a dark location to observe the Perseids. We found a suitable site some 15 km north of Ipswich, in a grassy field approximately 150 m off the road between Pettaugh and Debenham. The site had a clear northern horizon with only two houses in view. Before it became fully dark, Alan re-assembled his camera clock drive for the first time since his return from Australia. It took several minutes to find Polaris as the sky was still very bright. The sky didn't become dark enough for observing until nearly 21:00 UT. Around 21:30 UT, Alan noticed that a vehicle about half a kilometre distant was floodlighting an adjacent field with a powerful hand-held spotlight. During the next 15 minutes the vehicle drew ever nearer until the spotlight beam eventually reached our observing site and the vehicle passed by without as much as an inquisitive pause. We concluded that the local populace must be familiar with the sight of cars parked there, especially at night! 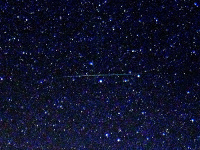 Up to the time we left at 22:45 UT, when the sky started clouding over, we saw some 30 meteors including four sporadics. 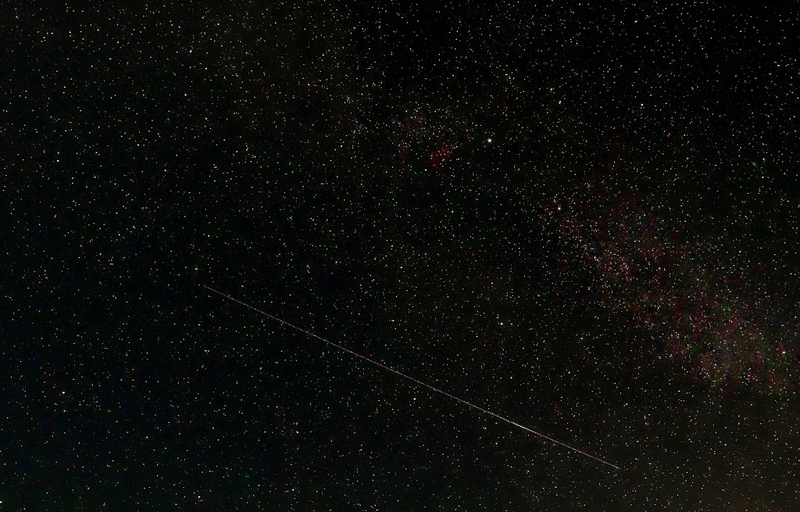 Most of the Perseids were between magnitudes 2 and 0 and many left long trails that persisted for several seconds. About half a dozen of these trails went across the northern part of Andromeda. We also witnessed numerous low flying aircraft and two satellites in polar orbits. By midnight on 11-12 August 1985, the sky was clear and as black as pitch. The Milky Way was like a ribbon of lace. At exactly midnight UT I saw, to the south, a fireball brighter than Venus. Then I got to counting meteors. Between midnight and 01:00 UT I counted 12 meteors even though I was trying to set up my telescope (to observe the graze of ZC869 at 01:38 UT). Between 02:00 and 03:00 UT, I counted eight more meteors. 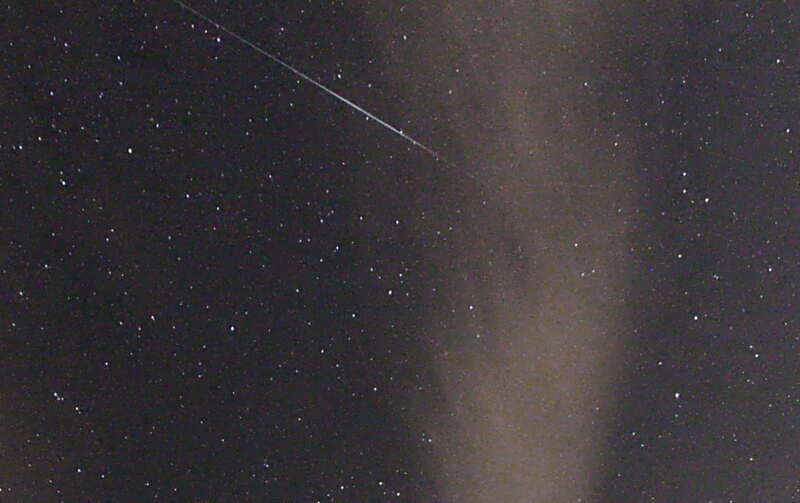 Recorded 22 Perseids and one sporadic meteor during the period 02:15 - 03:15 UT. Clouded out. However, four members attended and held an impromptu barbeque instead of a meteor watch! The nearly Full Moon hampered observations and the observers recorded only two meteors, one Geminid and one sporadic. This contrasted sharply with the total of 281 meteors recorded at the Geminid count in 1980! The night turned out to be one of the coldest for a long time, with temperatures plummeting to -30°C in places in the UK. The night sky did not become very dark until well after midnight UT. The observers recorded only a few meteors and ended the watch at 01:35 UT. Abandoned after an hour due to thick cloud, cold winds, and a prediction of a cloudy night ahead. 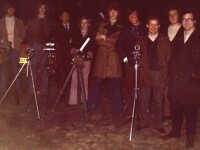 Six members of OASI gathered for a Geminids meteor count. The turnout was disappointing for the night of the predicted maximum (peak hourly rate of 50 predicted for December 14.2). However, it turned out to be a night to remember! Altogether the observers recorded 281 meteors including two spectacular fireballs of magnitude -5. The meteor watch started at 20:58 UT and continued to 01:30 UT with only a short break from 22:45 - 23:15 UT. Undoubtedly, many more meteors would have been recorded had it not been for cloud which invaded from the south-west. Observed for an hour after midnight. 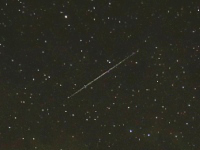 Saw 14 bright Perseids plus many faint ones. Cloudy apart from about ten minutes around midnight. Some new faces attended this meteor watch and hopefully were not too disappointed by the experience! 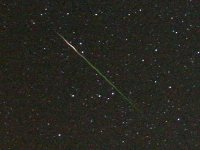 Nine members of OASI attended and recorded a total of 15 meteors, of which approximately half were shower. During a one-hour watch, together with two fellow observers I recorded 14 satellites, three shower meteors and two sporadic meteors. Six people attended but the weather was unfavourable so instead of a meteor watch, the would-be observers indulged in an impromptu game of football at Levington Creek. Illumination was provided by car headlights! Five members of OASI attended the count but it was a total wash out - the clouds rolled in as the observers arrived on site! Started with 15 people, but due to cold weather this declined to six at the end of the count. Counted two meteors: one Quadrantid and one sporadic. Four people attended. Totally cloudy with rain. Six people attended. Totally clouded out. 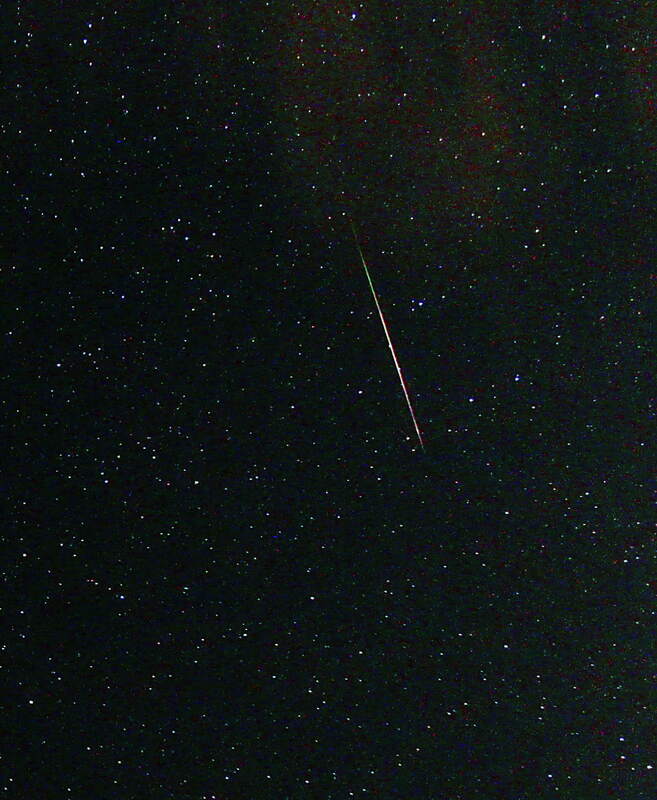 Observed four Geminids and four sporadic meteors. Attended by two members of OASI. Completely clouded out. Attended by five members of OASI. Observed 13 meteors. Interest waned as the date approached and the watch was cancelled. Four members attended. Clouded out. Totally overcast and no-one attended! Six members attended. Totally washed out by heavy rain. Had hoped for joint display of April Lyrids plus possible meteor shower associated with Earth's passage within 0.01 AU of the ascending node of Comet 1977b, P/Grigg-Skjellerup. Unfortunately, observations were clouded out. Attended by three members of OASI. Sky perfectly clear all evening. Observed three meteors and a fireball. Finished the count at midnight (before freezing to death!) and thus missed a magnitude -10 fireball spotted over Lincolnshire at 04:00 UT on 04 January. Three members of OASI attended. Sub-zero temperatures meant that the observers had to stand up and keep moving to avoid frostbite! 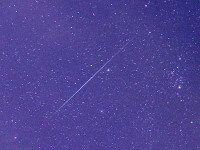 The observers saw nine meteors, most of them Geminids, including a magnitude -2 Geminid with a persistent train. Observations were hampered by a 22 day old Moon. Two members attended. Clouded out. Eight members of OASI attended and observed for one and three quarter hours. There was a nearly full moon (95%, waxing), which washed out the sky, and the observers counted only 17 meteors. Nine members of OASI attended and observed under a crystal-clear sky. 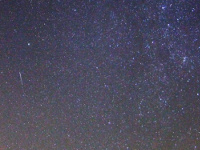 They counted six Alpha Capricornids and 40 sporadic meteors during a two hour period. Eight people attended, and observed from 21:50 - 23:39 UT. 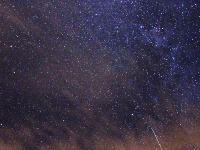 They recorded four Delta Aquarids and 30 sporadic meteors. Attended by seven members of OASI, who observed for one and a half hours. 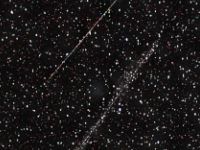 The observers counted 11 Lyrids and five sporadic meteors. Three observers attended the count. The intended observing site was Foxhall Heath but, on arrival there, the observers found Foxhall Stadium locked, so they found an alternative site at Martlesham. The party observed from a little after 21:00 UT until 22:30 UT, during which time they counted four Lyrids and four sporadic meteors. Only three members of OASI attended - the observation was clouded out. Four observers counted 67 meteors. Cancelled due to trip to Norwich. Four observers enjoyed clear, frosty skies and watched for just over two hours, during which time they counted 53 Geminids and 10 sporadic meteors. Washed out by torrential rain. Visibility of meteors affected by moonlight: only eight meteors recorded. Ten members of OASI plus nine visitors attended. Limiting magnitude varied from 3.5 - 4.0. Lightning to the east compromised the observations; however the observers recorded 34 meteors: 29 shower plus five sporadic. At 23:40 UT the clouds thickened and the observers abandoned the count. The night was crystal clear (limiting magnitude estimated as 5.5). Six members of OASI plus five visitors attended. The observers recorded 56 meteors: 32 shower and 24 sporadic. Eight members of OASI attended, but the count was abandoned at 23:30 UT due to bad weather. Recorded "a lot of meteors". Note: Meteor count held at request of BAA Meteor Section Director. Observations not recorded. Approximately eight members of OASI attended. Initially the sky was clouded out, but after a time the clouds blew away leaving a crystal clear sky. Observed one Delta Aquarid, several sporadic meteors, and several satellites. Observed 22:30 - 24:30 UT. Sky fair to good. 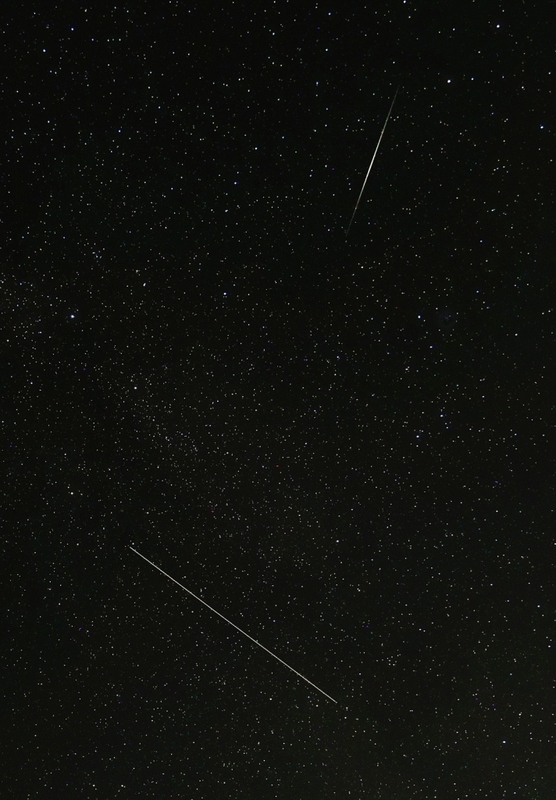 Recorded 18 meteors: 13 in the first hour and five in the second. 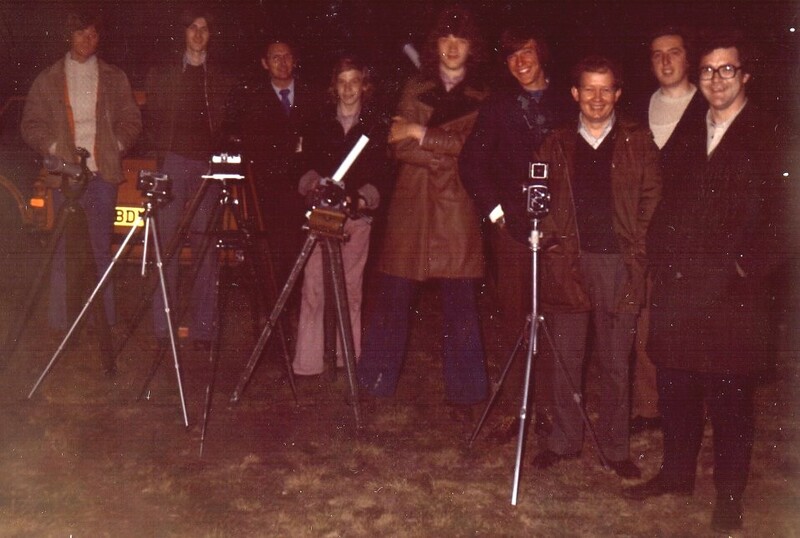 Members of OASI observing were: John Deans, Nigel Gage, Mike Howell, Mike Hadden, R Norman, David Barnard, Roy Cheesman, David Bearcroft, David Ling, Steve Flory, Tom Cardot. 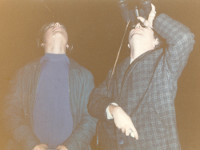 Photograph of the observers by Tom Cardot. L-R as follows: ?, Nigel Gage, Roy Cheesman, ?, Steve Flory, Dave Barnard, David Ling, John Deans, Dave Bearcroft. The date of observation was just within the normal limits of the Orionids, but all meteors observed were sporadic. The observers were: D Green (DG), C Green (CG), K Bantoft (KB). Sky: misty, especially at low altitude. No Moon. Limiting magnitude 4.5 - 5.0. Time of observations: 19:35 - 20:20 UT. 19:36 mag 1.5, reliability 1, observers KB & CG. Observers at the count. 19:45 mag circa -1.5, reliability 2, observer DG. 19:47 mag 3.5, reliability 2, observer DG.mag 3.5, reliability 2, observer DG. 19:56 mag 1.5, reliability 2, observer DG. 20:06 mag 2, reliability 2, observer KB. 20:08 mag -2, reliability 2.5, observers DG & KB, yellow train for 1 second. 20:10 mag circa 1.5, reliability 1, observer DG, slow. Reliability refers to the confidence of the observers in the observation, on a scale from 1=most reliable, looking directly at the meteor to 3=seeing the meteor out of the corner of the eye. Historical footnote on meteor observing in Suffolk. Observations of fireballs and satellites, 2018 onwards. Original: Newsletters February, July, September, November, December 1974; April, May, July, August, September, October, November, December 1975; January, February, March, April, May, June, July, August, September, October, November, December 1976; January, February, March, April, May, June, July, August, September, October, November, December 1977; January, February, March, June, August, September 1978; April, August, September, October, November, December 1979; March, April, May, June, July, August, September, October, November, December 1980; January, February, June, July, August, October, December 1981; January, February, April, August, September, October, December 1982; February, March, April, September, December 1983; April 1984; September 1985; September 1986; April 1987; August 1989; August, September 1990; August, September 1999; February, October 2007; October 2012; December 2013, September 2014; January 2015; emails August 2010, August 2012, August 2013, December 2014; emails August 2015; emails August 2016.